Contest! 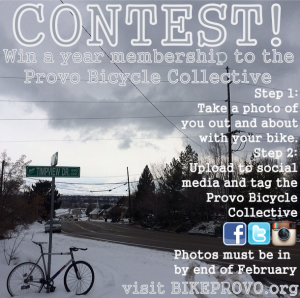 Win a year membership to the Provo Bicycle Collective! It’s February and you’re still out on your bike, riding though inversion smog and snowstorms. The Provo Bicycle Collective salutes you! Here’s your chance to win a year long membership to the Provo Bicycle Collective! Get unlimited bench time at the shop! Dollar off all classes and other events! We want to reward you for riding your bike! Take a photo of you out and about with your bike. Put your photo up on social media and tag the Provo Bicycle Collective. Get your photos to us by the end of February. We will pick the winner during the first week of March.